This weekend we took our own sage advice and visited Morristown National Historical Park, not just for the reading of the Declaration of Independence, but for a chat with the Revolutionary War soldier who fought with the Second New Jersey Regiment at the Battles of Connecticut Farms and Springfield. I was thoroughly impressed by the discussion - though challenged to speak as if it were July 1780 - and had the chance to get a few small but important questions answered. 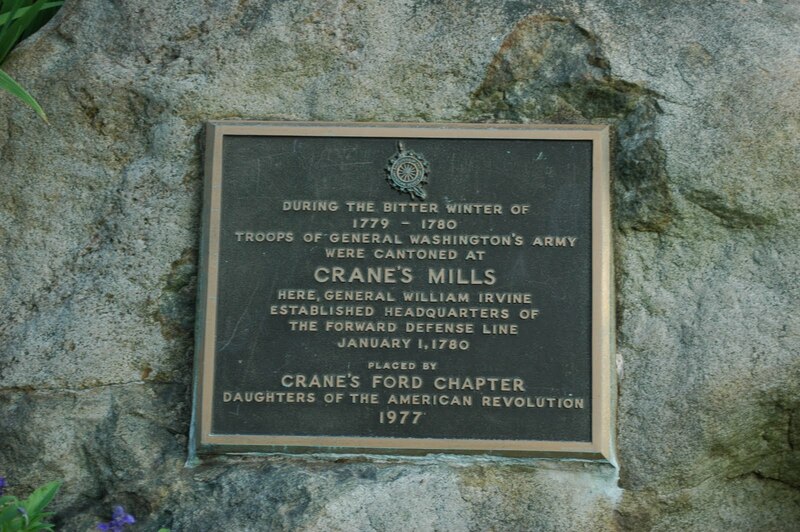 I knew, of course, that Washington's troops wintered in Morristown in 1779-80, but what were these others doing in Cranford? With the arrival of the army in Jockey Hollow, Morristown had become one of the most populated (if not the most) areas in the States, so was it that there wasn't room for Irvine's men? Why in heck were they stationed on the Rahway River, roughly 20 miles southeast of Washington's headquarters? 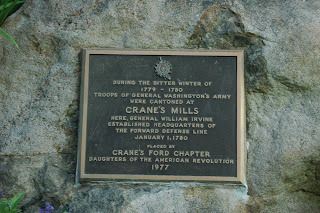 Naturally, I couldn't tell the reenactor about the monument in the park; instead I had to tell him there had been troops in Crane's Ford recently, but I didn't know why. The reason for the encampment becomes clear when you look at a map, particularly the hand-drawn one the reenactor had helpfully drawn of the area around Springfield, Union and points east. The British were stationed in Staten Island and made regular forays into New Jersey for food and other supplies, along with the occasional thwarted attempt to kidnap Washington. Troops like Irvine's (possibly the Second Pennsylvania, which he'd led at the Battle of Monmouth in '78) were stationed at various points between New York and Morristown to stop the Brits from coming any farther inland. Besides being defensive mechanisms, these troops also served as an early warning system, letting Washington and his subordinates know about enemy troop movements. No doubt, the Continentals established dozens of these camps near the logical entry points from New York, meaning that there could be an equal number of small memorials around like the one in the picture above. So many of us in New Jersey could be living and working on top of former Revolutionary War camps without even realizing it. Perhaps blood was not shed there, but each of these spots played a strategic role in protecting Washington, his army and the people of New Jersey from raids and worse. I, for one, am going to open my eyes a bit wider and keep an eye out for them, and I'd love to get a list going. Do you know of any memorials like these anywhere else in the state?